Les grands projets | One quality, the finest. Former French president François Mitterand was born on October 26, 1916. His lasting legacy was a series of improvements to the monuments of Paris, known as les grands projets (lay grahn prozjay) or les grands travaux (lay grahn trahvo), which means big projects or big jobs. The real name was much more, well, grand: Les Grandes Opérations d’Architecture et d’Urbanisme. The projects – that cost an estimated 4.6 billion Euros – have been compared to the undertakings of Louis XIV, and we know that those led to the near bankruptcy of the country and the fall of the monarchy. Ironically, les grands projets were created in part to celebrate the 200th anniversary of the Revolution. Another project, the Centre International de Conferences was planned but never built due to cost overruns on the Bibliothèque. Mitterand died on January 8, 1996, almost a year before the Bibliothèque opened. Love them or loathe them, Mitterand’s projects certainly did change the appearance of Paris more than anyone else in the 20th century. 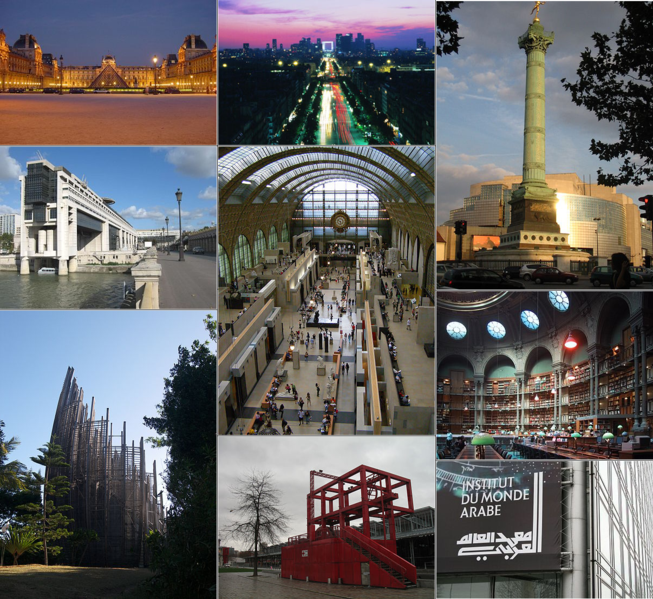 This entry was posted in Architecture and tagged Arab World Institute, François Mitterrand, Grande Arche, Les Grandes Opérations d’Architecture et d’Urbanisme, les grands projets, les grands travaux, Louvre, Musée du Louvre, Parc de la Villette. Bookmark the permalink. Pingback: Five on Friday | One quality, the finest.